The 2015 Festival is now set and ready to go and will be bigger and better than last year. It will take place on the weekend of 19th/20th September: on Saturday 19th there will be a warm-up party at the newly refurbished Railway Inn in Portslade and the main Festival (see below for a complete listing of events) will take place on Sunday 20th at the Ropetackle Arts Centre, Shoreham High Street, BN43 5EG. We have a fantastic line up with lots of jams to join in with and guests playing all through the afternoon and early evening. So far we have four workshops and are adding more all the time. We will be raffling a new handmade ukulele donated by our main sponsor Noah Ukuleles. Hove Park School will be joining us at the festival, they were great at Paddle Round the Pier this year. Youngsters are the future and lifeblood of the instrument so look forward to seeing them play. The Secret is a ukulele band formed from the LUSH jam playing their own original material. Listen to Meriel’s Secret here. Our sister jam from Worthing, the “original” south coast jam. Join in, they will supply the songsheets. A new combo, formed by our very own Pete, who perform for residents in a number of nursing homes in the local area. Another join in session with songs provided. A welcome return from this duo, visual and entertaining. See the Flying Aspidistras on YouTube. Developing a cult following, this female jam will set your toes tapping with their energy and swing. You can join in and they will provide songsheets. All the way from Hove, this well rehearsed jam will lead us with their mixture of old and modern songs, again songsheets provided. A mixture of mandolin and uke, these boys have really got popular in the last year playing in well known venues and festivals. Listen to Scandomando here. The Brighton evening jam steps on to the stage led by Irena, bound to be lots of them inviting us to play along. Formed from Uke @ the Duke and the Hove Folk Club, this trio will release their album later in the year. A mix of uke, flute and guitar. Usually behind the bar at the Uke @ the Duke meetings, he will bounce his way around the Ropetackle. Running a workshop here, then appearing on stage. One of the country's leading players, you have to see him to believe in the power of the uke. Listen to Ben's superb playing here. Never played before? Don’t know what all the Uke fuss is about? Theresa will have you playing a song in ten minutes. After this workshop you will have all the tools you need to join in the jams during the afternoon. Some spare ukes are available, but please bring your own if you have one. Children welcome with accompanied adults. What comes first, the tune or the words? A basic workshop for uke players who want to play more than covers. We will write a song during the workshop. Pete will demonstrate some strums which will enhance your playing and improve any songs. Let Ben get those fingers working and teach you how to improve your playing. Not just a workshop for the day, but it will give you enough knowledge to go home, practice and improve. Refreshments will be available all afternoon as well as a bar stocking a full range of alcoholic and soft drinks. Hophead will of course be on tap. The Uke @ the Duke philosophy is that everything we do should be accessible to everybody so there is no entry fee, but if you could donate into the welly boots which are around the venue that would be really kind of you. The workshop for beginners is free, but we have to cover costs on the others so there is a moderate charge. 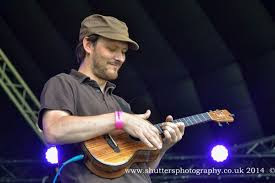 The organisers would like to thank Noah Ukuleles for their continued support of the event, please visit their stall and web site. Thanks also to Fat Flyers for their help with publicity. Visit the 2014 page for a look back to last year's festival. If you were there in 2013 see what happened then. Finally there is a page about Uke at the Duke, our monthly jam, as well as some links to other jams on the coast.